BMW R1200RT windshield Tall VStream for R1200RTBy popular demand, a NEW taller/wider size (ZT-Z2403). It's so quiet, even your passenger can hear the radio! Join the VStream Revolution! 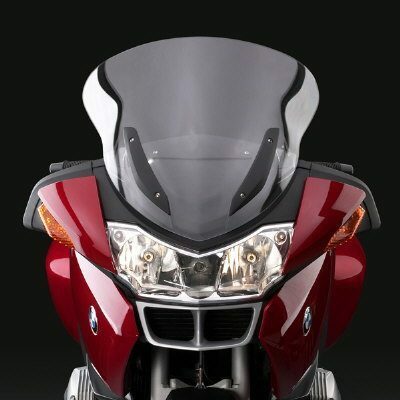 The BMW R1200RT Windshield Ztechnik Z2403 is a taller and wider version of the popular Z2402. It's the perfect shield for the taller rider, or for those who want even greater wind protection. State-of-the-art Quantum™ coated polycarbonate gives VStream windshields outstanding clarity and strength characteristics unmatched by any windshield maker worldwide. This exclusive combination of Quantum and polycarbonate is 30X more resistant to abrasion than acrylic materials, has better UV life, chemical resistance, and optical definition, and has superior crack and impact resistance.